The Luxe Comfort Foot Rest from Aidata is designed to reduce muscle strain and fatigue by supporting the legs and feet at an optimum height and angle. 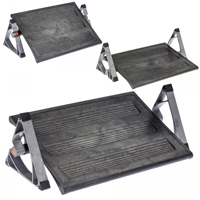 The free floating large rubber non-skid platform keeps feet secure while resting on the footrest. The textured surface has a raised bump pattern to further maintain foot placement and to provide a comfortable texture when footwear is removed. Two ranges of angle adjustment are available, a 15° range at the lower height setting of 3.75" and a 30° range at the greater height of 4.75". Changes in both the angle and height settings can easily be completed by the feet, eliminating any need to bend or reach below the desk. 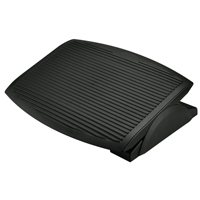 The Luxe Comfort Foot Rest is made of a durable high impact ABS plastic and features a noticeably heavier construction than most standard footrests. It is available in a grey-black two tone design or an all-black design. 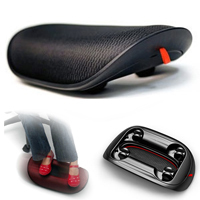 Robust design and firm, solid construction make the Ergo Plus Foot Rest both durable and practical. The platform tilts ± 20° and freely adjusts to the angle of the feet due to the non-locking adjustment mechanism. 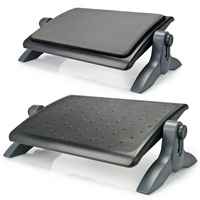 In addition, the rubber-padded underside of the foot rest helps keep the feet firmly in place with little risk of slippage, while the raised horizontal-lined texture of the platform surface helps the feet stay secure on the platform while adjusting the angle of the feet. The Innovative Footrest from Aidata incorporates all the important aspects of an ergonomic foot rest into a simple, graceful design. The frame, supports and platform are made with sturdy, high-impact plastic and the rubber pads on the supports keep the foot rest in place beneath the desk. The Innovative Footrest is available in two styles. The platform on model FR-1002RG is covered with textured rubber to prevent the footwear from slipping on its surface. For greater comfort, especially when used without footwear, Model FR-1002SG features a padded foam surface with a breathable mesh cover. Both models provide users with a large surface approximately 16" wide by 10.5" deep. The platform is also height-adjustable between 3.5", 4.5" & 5.5" high, and is non-locking to allow users to vary the platform angle ±15° as desired. The Relaxing Footrest from Aidata uses several design features to distinguish itself from many other footrests currently available. 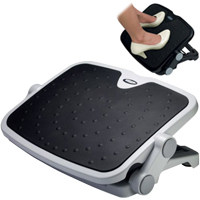 The large (17.7" W x 13.0" D) non-skid platform includes "acupressure bumps" which can be used without footwear to gently massage the feet. The height adjustable platform has 3 height settings - 4.5", 5.8", and 6.3" and is also free floating at each height setting, accommodating the desired angle at the ankle - either positive or negative. 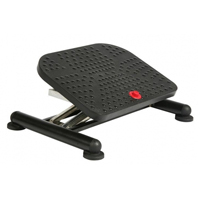 This foot rest features robust construction with both the base and footplate having extensive structural reinforcement and the non-skid pads on the base ensure secure positioning for the user. Note: This platform cannot be fixed at a desired angle. The Adjustable Foot Rest from Aidata is a lightweight, economical foot rest that offers dual height and multiple angle settings. 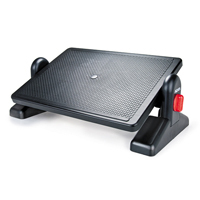 Users can set the foot platform to 4.5" or 5.7" off the floor and the foot rest can be locked at any of the 4 available angle settings (0°, 10°, 20°, & 30°). 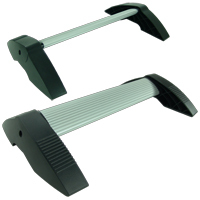 Height and angle adjustments are accomplished with hand-operated knobs on the sides of the foot rest. 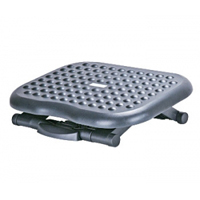 The surface of the Adjustable Foot Rest is textured to provide traction to aid users in maintaining proper foot position and non-skid pads keep it securely positioned where required. Note: This is considered a "locking" footrest which means that the foot platform remains locked in at the chosen angle.